The Stick Rake is the ultimate attachment for land clearing, rock sorting, recycling and loading. Our rakes are made from high quality steel and will handle the rough treatment stick rakes are expected to endure. The Stick Rake allows you to remove vegetation but leave the soil behind. 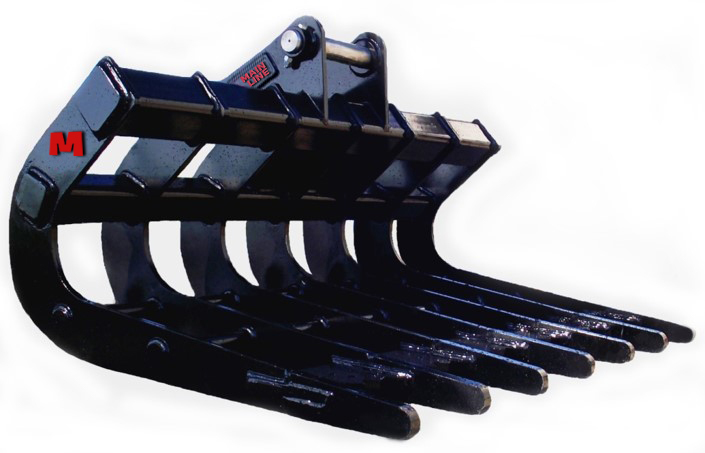 The shape of these rakes is designed to allow the operator to easily scoop up the materials. When working with trees the logs will sit nicely in the rake without sliding out. Our customers use the rakes for raking up loose stone and sifting rock from soil piles. When raking scrub gorse and cleaning up slash the Bizalloy 400 tips will pluck out the roots leaving the ground clean and tidy. The rake can be easily be turned around and used in the push away from the machine motion.